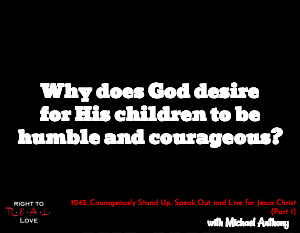 In this episode, Jay is joined by pastor and author Michael Anthony to address the question: Why does God desire for His children to be humble and courageous? Why does God desire for His children to be humble and courageous? How fear hinders many people from standing up and speaking out on behalf of Jesus Christ. Common misconceptions people have about humility. Why humility is attractive to God. The relationship between biblical courage and biblical humility. Michael shares how he discovered the importance of biblical humility.